Kenneth Allan 'Ken' Doolan was born in Hurlstone Park, Sydney on 15 January 1939. He attended Kyogle Primary School, Wilston State School and Kedron State School before entering the Royal Australian Naval College in 1953. He graduated from the College in 1956 and undertook training at sea in HMAS Swan, during 1957, before proceeding to England for further training at Britannia Royal Naval College (BRNC) Dartmouth in 1958. He was promoted to Sub Lieutenant in September 1958. Upon return to Australia, Doolan joined the destroyer HMAS Vendetta in January 1959 where he gained his watch keeping certificate during a nine month deployment to South East Asia. He spent one year as Naval Assistant to the Hydrographer in 1960-61 before promotion to Lieutenant in February 1961 and completing a direction officers’ course at HMAS Watson. He was then posted to the destroyer HMAS Voyager as direction officer. While the destroyer was in a long maintenance period in mid-1962 he was loaned to the aircraft carrier HMAS Melbourne for three months. In January 1963 Lieutenant Doolan went to HMAS Cerberus for a year as the Commander’s Assistant. In January 1964 he was appointed Aide-de-camp to His Excellency the Governor-General Lord De L’Isle VC and was promoted to Acting Lieutenant Commander in mid-1965 on becoming Military Secretary, first to the Administrator of the Commonwealth, Colonel Sir Henry Abel Smith and later to Governor General Lord Casey. He went back to sea as the direction officer of HMAS Vampire in 1966 and saw service in South East Asia before undertaking the long navigation course in the UK. This was followed by two years exchange service with the Royal Navy as the navigating officer of the frigate HMS Torquay. Doolan was confirmed in the rank of Lieutenant Commander in early 1969. On return to Australia Doolan became navigating officer of the destroyer HMAS Perth and saw active service in Vietnamese waters in 1970-71. He was the inaugural Chief of Naval Personnel’s Liaison Officer in 1971-73 before joining the destroyer HMAS Hobart as the Executive Officer. In 1974-75 he attended the Canadian Forces Command and Staff College and, after graduation, was promoted to Commander in June 1975. He remained in Canada and served on the instructional staff of the staff college until 1977. An appointment as fleet plans and navigating officer, on the staff of the Flag Officer Commanding the Australian Fleet, followed in 1978-79 after which he was posted as the commissioning Commanding Officer of HMAS Tobruk during 1980-81. Doolan was promoted to Captain in June 1981 and remained in command of Tobruk until the end of the year. In 1982-83 he served as the Director of Naval Officers Postings in Navy Office and then as Director of Naval Force Development in 1983-84. Captain Doolan was the Commanding Officer of the destroyer HMAS Brisbane during 1984-85 and Director of Naval Plans during 1985-86. On promotion to Commodore in 1987 he served as the Naval Attaché Washington, and Naval Adviser Ottawa, before returning to Australia in January 1989 on promotion to Rear Admiral. 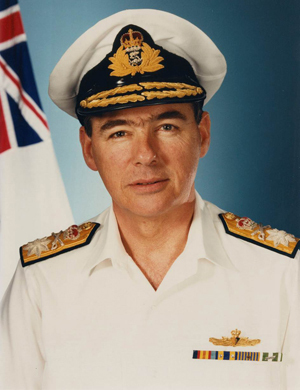 Rear Admiral Doolan then served as the Assistant Chief of Naval Staff (Development) and Deputy Chief of Naval Staff (1989-90), Maritime Commander Australia (1990-91), including command of the fleet during the First Gulf War. Ken Doolan was appointed an Officer in the Military Division of the Order of Australia (AO) in the 1991 Australia Day Honours List ‘in recognition of service to the RAN as Assistant Chief of Naval Staff (Development) and Deputy Chief of Naval Staff’. During 1991-93 he served as the Assistant Chief of the Defence Force (Development). Rear Admiral Kenneth Doolan retired from the Royal Australian Navy on 6 December 1993. He then went on to undertake a civilian instructional post, in mid-1994, at the Philippines Armed Forces Staff College after which he was appointed Commissioner for an Inquiry into the Establishment of an East Coast Armaments Complex. Doolan then became a member of the Defence Force Remuneration Tribunal during 1996-99 and an investigating officer for redresses of grievance for the Vice Chief of Defence Force in 2001. From 2002-04 he was National Secretary of the Order of Australia Association and from 2003-05 was the Company Secretary of the Order of Australia Association Foundation Limited. Rear Admiral Doolan has also been a member of the Returned and Services League of Australia since 2002 and in 2009 became its National President. He is also an author of two books on naval history concerning HMA Ships Tobruk and Brisbane.